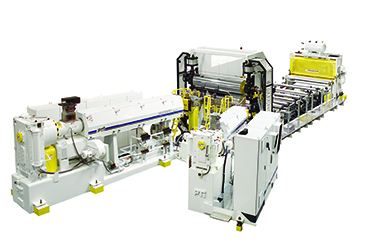 Sheet extrusion systems, Extruders, Co-Extrusion Sheet System used to produce custom sheet. 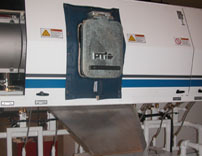 Down Stream Devices include a high speed Sheeter and winder unit. 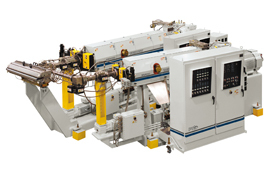 Trident® Model 6000/3500 Co-Extrusion Sheet System used to produce custom sheet. Down Stream Devices include a high speed Sheeter and winder unit. The world of extrusion continues to evolve year to year. Developments in resin, tooling, equipment, controls, processing methods and end-uses define this evolution. While these changes play an integral role in keeping markets on the move, they also keep plastics processors constantly challenged. PTi addresses this evolution and other important issues facing producers with our Forward Design approach. Forward Design is a design philosophy that anticipates the changing needs of our customers. By designing and creating a high quality production system that features the right degree of versatility, customers are able to meet the changing demands of these markets head on.